Named for Windsorite Joe Turner, a goalie turned soldier during World War 2, the cup was given annually to the winner of what would become the International Hockey League. Photo Credit: Hockey Hall of Fame. Trophy: Turner Cup. Digital image. Joseph Turner Memorial Cup. The Hockey Hall of Fame, n.d. Web. 5 Nov. 2016. Because of WWII, the Michigan-Ontario Hockey League was forced to shut down during the 1940’s. After the war, with only 6 teams in the NHL and a considerable number of hockey players, there was a need for a new developmental league to feed into professional ranks. With a sudden influx of available players and nowhere to put them, a meeting was held December 5th, 1945 at the Norton Palmer Hotel in Windsor between hockey legend Jack Adams of the Detroit Red Wings, several other Red Wings officials, and other professionally non-affiliated local hockey supporters including Gerald McHugh – a Windsor lawyer who would become the league’s first commissioner. This meeting produced what grew into the IHL. The league was initially created to provide opportunities for local hockey players returning home from the war to play, with thoughts that it could eventually expand beyond Windsor-Detroit. The first four teams in the league that would eventually spread across North America included the Detroit Auto Club, Detroit Bright’s Goodyear, the Windsor Spitfires, and the Windsor Gotfredsons. Windsor teams would win the trophy twice: the 1946-47 Windsor Spitfires, and the 1948-49 Windsor Hettche Spitfires were both champions before the league bypassed the area. The last Canadian team to win the trophy was the 1949-50 Chatham Maroons. 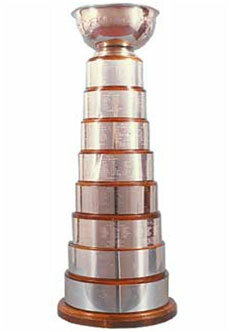 The trophy would live on until 2000-01, when the Orlando Solar bears were the final winner. The league folded after that season with the American Hockey League and East Coast Hockey League being the predominant feeder leagues for the NHL.